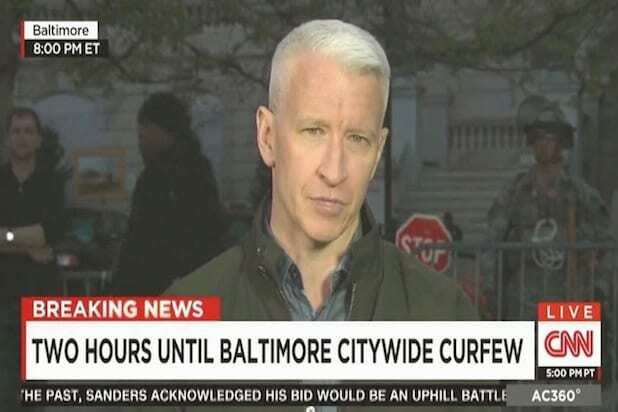 After witnessing the violent protests following the death of Freddie Gray in Baltimore, CNN’s Anderson Cooper says the city has overarching problems to tackle once the smoke clears. TheWrap spoke to Cooper about his experiences covering the upheaval, how the situation in Maryland is different from what happened in Ferguson, Missouri; and his “weave store” comment that had Larry Wilmore so amused. TheWrap: What’s it been like for you over there? Anderson Cooper: As you see on television, it’s obviously an extremely stressful time for people here. Tensions are high. There’s a huge variety of people here. We’ve seen, particularly in the last 24 to 36 hours, large numbers of community groups and pastors, moms, dads and men in the community who’ve come out to try to tamp down the violence and who have been very effective in standing between police and some of the crowds. I think that’s made a huge difference. Certainly today is very different than yesterday and yesterday is very different than it was the day before. It’s hard to describe. People are coming at this from a lot of different perspectives and a lot of different experiences. But there’s certainly a lot of tension, there’s a lot of anger and it’s understandable. Are you seeing a difference between this story and other police brutality stories recently? I’m always wary of comparing one situation to another. I think each place is different and the issues are also very different. Obviously, there are some commonalities. But I think the fact that you’re seeing so many people with cameras now is one reason why we’re seeing more and more of these and I think we’re going to see more and more of these as body cameras become more ubiquitous… There are real issues going on in Baltimore that need to be addressed and I think there’s a renewed optimism among some community leaders that I talked to. There’s renewed desire on the part of people in this community to see change. But there are some really big concerns about the ability to actually affect change and to rebuild and to do better. Some Baltimore residents have complained that the media only showed up after things got really bad on Monday, that journalists were too busy dining at the White House Correspondents’ Dinner. What do you say to them? I didn’t go the White House Correspondents’ Dinner. I went once 10 years ago and vowed never to go back. It’s not my kind of thing. That being said, it’s simply untrue to say that CNN has not been covering the death of Freddie Gray. From the moment the video was released, I’ve been leading off my broadcast on many nights with it. To say that nothing was done until Monday night when the violence erupted is simply not true… I certainly understand the frustration of people who maybe wanted to tune in Saturday and ended up seeing the White House Correspondents’ Dinner but I don’t have a hand in those decisions. I don’t have the logistics of how those decisions are made. What’s the most shocking thing you’ve seen on the ground since you arrived in Baltimore? I wouldn’t say shocking because I think it’s an overused word. But, to me, seeing last night and all day yesterday a line of people linking arms, trying to police each other and trying to stand up and say, “This is who we are in Baltimore, this is who we are in this community,” what I heard from many people who were on our air last night is, “That’s who we are. That’s what Baltimore is at its best.” And that’s made a huge difference here. And I think that’s been one of the most impressive things, to see involvement of community leaders, pastors and organizations, people who just wanted to stand up for the community and who came out as soon as the violence stopped with brooms, rakes and shovels and whatever they had and just started picking up the pieces. This story has sparked a national conversation about race relations in this country. How hard is it for someone on the outside, especially a white reporter to cover this story? I think the most important thing for any reporter no matter who they are is to listen to what people are saying and allow people to talk. I think that’s what I’ve been trying to do and I think that’s what all the reporters here have been trying to do. Larry Wilmore said you were out of your element, mocking your struggle over whether to call a looted and burned-up shop a “weave store” or a “hair store.” What happened there? It was a stupid thing to say I had been broadcasting for two hours. I should have said beauty supply store. You know this is life. Wilmore actually thought you were too careful and that there’s nothing wrong with saying “weave store.” Do you agree? I don’t think it’s a big deal. You’re the one who’s asking about it. Is the Freddie Gray story part of a larger problem that should be dealt with on a national level? There’s all this talk about the need for a national conversation about race. You always hear that in the wake of a violent act. I think that although that may be true, there needs to be a conversation about race not in the wake of violence. Those conversations need to be had at many different times. It can’t just be one conversation. I think all of us have a lot to learn still.